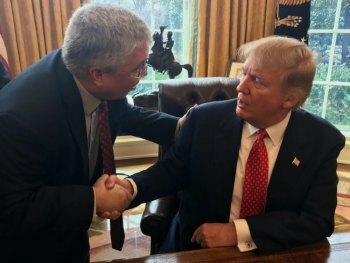 CHARLESTON — West Virginia Attorney General Patrick Morrisey discussed efforts to reinvigorate coal mining and eradicate the state’s opioid drug epidemic during a Tuesday meeting with President Donald Trump. The Attorney General visited the White House as part of this week’s Winter Meeting of the National Association of Attorneys General. “It was a pleasure to meet with President Trump. His invitation and willingness to meet with myself and fellow state attorneys general demonstrates his respect for cooperative federalism and the role of states in the fabric of our nation. “I appreciated the chance to impress upon President Trump the importance of eradicating the nation’s opioid epidemic and rolling back unlawful regulations that have crippled coal mining communities in West Virginia – both issues that are critical to economic growth. “In regards to substance abuse, I discussed the need for a holistic approach to reduce the supply and demand of prescription opioids, as well as an educational component necessary to prevent future addiction. “With regards to energy, I underscored the need to rollback eight years of job-killing regulation, including the so-called Clean Power Plan, all of which crippled investment in coal and devastated those who depend upon coal’s success.